The question sought to establish the extent to which individual campaigns were visible among the general public and the number of those who had heard of them. 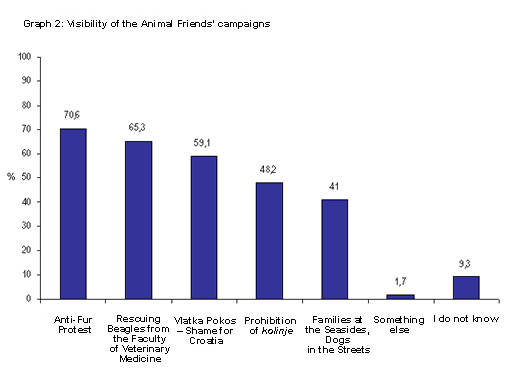 As many as 70,6% of surveyed persons have heard of the "Anti-Fur Protest," while somewhat less, namely 65,3%, have heard of the campaign of "Rescuing Beagles from the Faculty of Veterinary Medicine." On the other hand, 59,1% have taken notice of the campaign called "Vlatka Pokos – Shame for Croatia," 48,1% have heard of the "Prohibition of kolinje (traditional home slaughtering)," and 41% of "Families at the Seasides, Dogs in the Streets."